THE HAGUE - A team from Excel Arts Academy from Curacao shined at Noordeinde Palace this morning with pride in receiving the congratulations from Queen Máxima by winning an Appeltje van Oranje (Appel of Orange). The prize consists of a bronze statuette designed by Princess Beatrix and an amount of 15,000 euros. As a young girl, founder Shelomi Doran-Bakhuis discovered that dancing helped her overcome her uncertainty. She was 12 when she started giving other children dance lessons. When she was 18, she founded the Excel Arts Academy, which aims to help children get the best out of themselves. The organization has now helped over 35,000 children and young people with 35 volunteers. With success, Máxima recalled, because one of them has even become a minister. The team had known for several weeks that it belonged to the three winners. 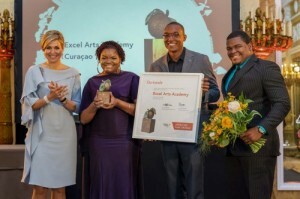 Nevertheless, Queen Máxima had a great surprise today - in the presence of King Willem-Alexander, Princess Beatrix, Minister Anthony Begina, all nominees and guests of honor - announcing that the Excel Arts Academy has been awarded the largest of the three apples as the most special project of all entries. The allocation of the Apples is an initiative of the Oranje Fonds. This year the theme was 'Young and socially enterprising'. The Curaçao Foundation We Believe Kids of Raichel SintJacoba, among the 100 nominees, included a large proportion of his savings and salary to offer children after school activities and to ensure that they receive a hot meal.